In this week’s episode of the Working With Podcast, I answer a question about getting overloaded email under control . Hello and welcome to episode 68 of my Working With Podcast. A podcast created to answer all your questions about productivity, GTD, time management, self-development and goal planning. My name is Carl Pullein and I am your host for this show. I can’t believe it has taken 68 episodes to finally get to one of the biggest problems people face when it comes to productivity and time management and that is email. We all have it, and for most people, it is out of control and inboxes just get bigger and bigger every day. So, this week we are going to tackle the issue and hopefully help you to finally get email under control and, more importantly, make it so it is easily manageable and it never gets out of control again. But first, I am excited to tell you all that the 2019 edition of my most popular, complete productivity and time management course has just been released. Your Digital Life 2.0 Online, the 2019 edition is now available and this year I have added a brand new workbook you can download and keep so you have a ready reference guide for when things slip. Also, I have added a number of new classes around the Golden 10 and the 2+8 Prioritisation systems AND… I have updated the freebies so now you have access to two of my most recent courses for FREE! So go on and check it out. The link to the course details is in the show notes. This course WILL give you everything you need to become super productive and much better at time management. Okay onto this week’s question and that means it’s time for me to hand you over to the mystery podcast voice for this week’s question. This week’s question comes from Greg. Greg asks, Do you have any tips to help me get my email under control. I have over 4,000 emails in my inbox and I just do not know where to start to get this mess under control. Any help would be much appreciated. Thank you, Greg, for this excellent question. Okay, first up. Email is just another task input we have to make a decision about. Whenever a new email comes in, we need to decide what it is and what we need to do with it. Email is unique in many ways though. Unlike regular tasks, where you add it to your inbox, with email someone else is adding it to your inbox. You don’t have much control over what and how much comes in each day. Or do you? You see, part of the problem is we sign up for all sorts of newsletters, promotions and other services and each day those services and newsletters come in. Day after day. Because we have no control over when these newsletters and promotions come in we just let them pile up. They invade our inboxes and just sit there waiting to be dealt with. But of course these emails are not important and so we just leave them, hoping that we will have time soon to go through them and read them. Which we don’t do. So, here’s my first tip. Get them out of your inbox. Instead, create a webmail account. You could create a Gmail or Hotmail account for instance and only have that account available to you through the internet. Do not put this account into your email app. Only allow yourself access to it through the internet. Other things you can use this account for is online shopping. Every time you order something use this email address. The companies you buy from will use your email address to send you offers and other promotional emails after you have ordered something, some of which you may be interested in. So having this extra email address just for your shopping and newsletters is a great way to get a lot of the email you receive each day out of your mail email accounts. All you need to do then is create a recurring task in your to-do list manager to remind you to check this account from time to time. Okay, for most of you, that will probably get rid of 50% or more of the email you receive each day. It puts you back in control of what email you see each day. Now, onto the management of your email. All you really need today is four folders. An inbox, an Action Today folder, a waiting for folder and an archive. That’s it. All the popular email apps today have excellent search. Gmail for Android and iOS has excellent search and so does Apple’s Mail app. This means even if you have thousands of emails in your archive, you will still be able to easily find what you are looking for whether you are searching for it by date, person or title. Learn to trust the search. It works and archiving email is not deleting email. It still going to be there if you need it. Right, so you now have the four folders set up, how do you manage email? Well, when an email comes in you need to make a decision about what it is and what you need to do with it. Let’s say you get an email from a customer asking you to do something for them. It could be to send a copy of a receipt or confirm when an order will arrive. So to answer the question what is it we have an email from a customer, the next question to ask is what do I have to do with it? In this case that would reply and send the copy invoice or confirm an expected delivery date. If you can do that within two minutes or so just do it now. There’s no need to have that hanging around when all it would take is two minutes of your time. However, if you need to find the invoice, or talk to your delivery agent first, that is going to take more than two minutes and you do not have time right now, then move the email to your Action Today folder. Now the thing about the Action Today folder is you need to make sure you deal with any email in there within 24 hours. If you do not have such a rule, then this folder will just end being a dumping ground for emails you have to do something about, but tell yourself you do not have time. Rules are a must here. So, apply a rule that any email in your Action Today folder must be dealt with within 24 hours. This will mean you will need to create a routine to check your Action Today folder every day. I have a recurring task in my to-do list manager that tells me to clear my Action Today folder every day and for the most part I manage to do that. You waiting for folder does exactly what it says. Any email you are waiting for a reply on goes in there. Now you will have to go into your sent folder and move any email you are waiting for a reply on into this folder, but that just takes a second or two so should not be too inconvenient for you. Once you receive the reply, as long as you haven’t change the title, the reply will be added to your sent email and you can then archive it straight from your inbox without having to move anything from your waiting for folder. Okay, so there’s some structure to your email processing system, what do you do with those 4,000 emails in your inbox? Well, here you have a choice. You can either do a hard email bankruptcy or a soft one. The choice is yours. A hard email bankruptcy means you select all the emails in your inbox and just hit the delete key. It’s the fastest way to get to inbox zero. For those of you who are a bit squeamish about this don’t worry. If an email was important, the person who sent it to you will soon send it again. If the thought of deleting all your emails scares you, you can create a new folder and call it “old inbox” and again select all your email in your inbox and move them to this new folder. Then, as and when you have time you can go through it and delete emails that mean nothing to you or move them to your archive if you want to keep them. Now here are a few tips to help keep your email numbers down. The first tip I can give you is send less email. Instead, use instant messaging or just pick up the phone. Too often we take the easy route and send an email to ask a simple question that could be done in less than a minute if you picked up the phone. When you send that kind of email inevitably you are going to get an email in reply. My rule here is only send an email if it is absolutely necessary. The less email you send, the less email you get in return. Before sending an email, just ask yourself if there is a faster way to get the outcome you want. You’d be surprised how often you find a better, faster way. Another tip is to protect your email address like you would your telephone number. Only give it out to people you trust. One of the worst things you can do is to put your business card into one of those collection boxes you find in bars and restaurants promising you-you could win a prize. True, you might win a prize, but you are also compromising the integrity of your email system too. To me, that price is far too high to risk having my email address added to yet another mailing list. Finally, I see a lot of people sending actionable emails over to their to-do list manager. Don’t do this! All this is going to do is fill up your to-do list inbox and you will be going from one app to another app and back again. That is such a waste of time. Emails that need you to take action should be in your Action Today folder in your email app. All you need is a simple task telling you to clear your action today folder. As I said earlier, I have such a daily recurring task and I see that around 4 or 5pm. I will then spend thirty minutes or so dealing with those important emails. Well, Greg, I hope that has given you some tips you can implement. I find the tip that has the biggest impact on your email is to create that Action Today folder and make sure you clear it every day. Seeing a list of ten or so emails that need action is far easier to manage than a list of 4,000 emails you are not sure whether they need replies or not., and if they do it takes you so much time to actually find the email you want to reply to. Thank you for your question, Greg, and thank you for listening to this podcast. 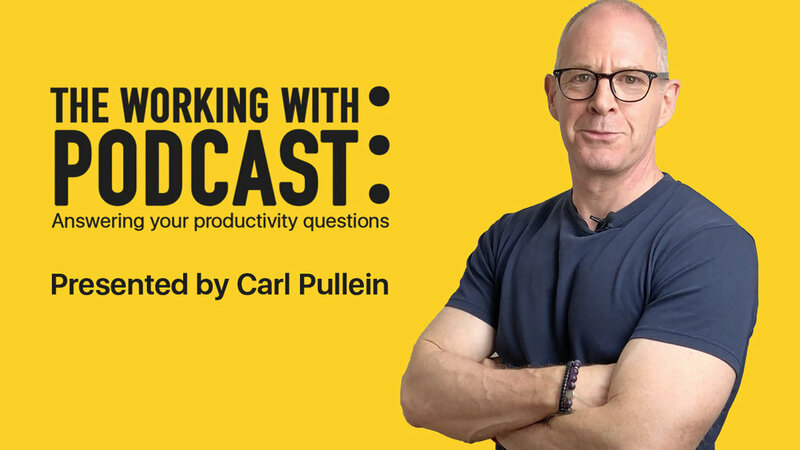 Don’t forget, if you have a question you would like answering then email me(hahaha) at carl@carlpullein.com… Don’t worry my email is completely under control and you WILL get a reply within 24 hours… I promise. Or you can DM me on Twitter or Facebook. It just remains for me now, to wish you all a very very productive week.